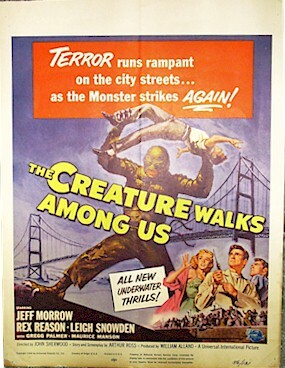 1956 - From the classic "Creature" trilogy, this is the third and final Creature film. 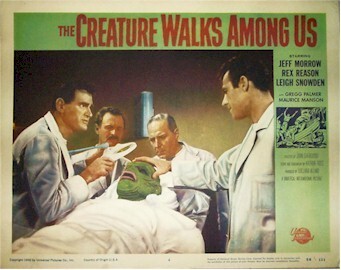 A cult horror classic from the 50's. The "Creature from the Black Lagoon" one sheets sell for up to $10000!! This and the "Revenge.." are sure to follow suit in appreciating value. Here is a great window card in excellent condition. Top has been trimmed as most window cards were. The BEST card of the set (in my opinion). Great scene, close-up of monster's face, red lips. Super NICE!